News that Intel was delaying its 10-nanometer processors came as a blow to many, but it appears we don’t have long to wait for the new Core i9, Core i7, and Core i5 parts, which are built on the 14nm++ node. 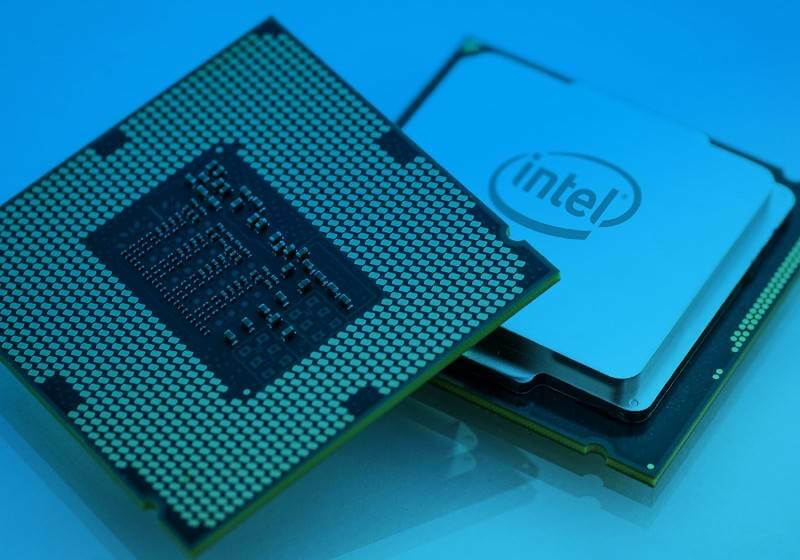 According to WCCFTech’s sources, October 1 will see the launch of three next-gen unlocked CPUs, with the rest of the chips arriving in the first quarter of 2019. Among the initial releases is the hugely anticipated Core i9-9900K. Not only will this be the first mainstream desktop Core i9, but it also comes with 8 cores and 16 threads. The Core i9-9900K has a base clock of 3.6 GHz, which can be boosted up to 5.0GHz in single and dual cores. It can hit 4.8GHz in four cores, and 4.7GHz in six and all eight cores. The CPU is also said to come with 16 MB of L3 cache and Intel’s UHD 620 graphics chip. Next is the Core i7-9700K, which is thought to be the first mainstream i7 chip with eight cores. As Intel is making hyperthreading an i9-only feature, the i7-9700K has eight threads. It also features a 3.6GHz base clock but slightly lower boost speeds than the i9-9900K—though it is reportedly $100 cheaper and has the same 95W TDP. Finally, there’s the 6 core/6 thread Core i5-9600K, which has a 3.7GHz base clock and a 4.3GHz boost with all cores (4.6GHz single). 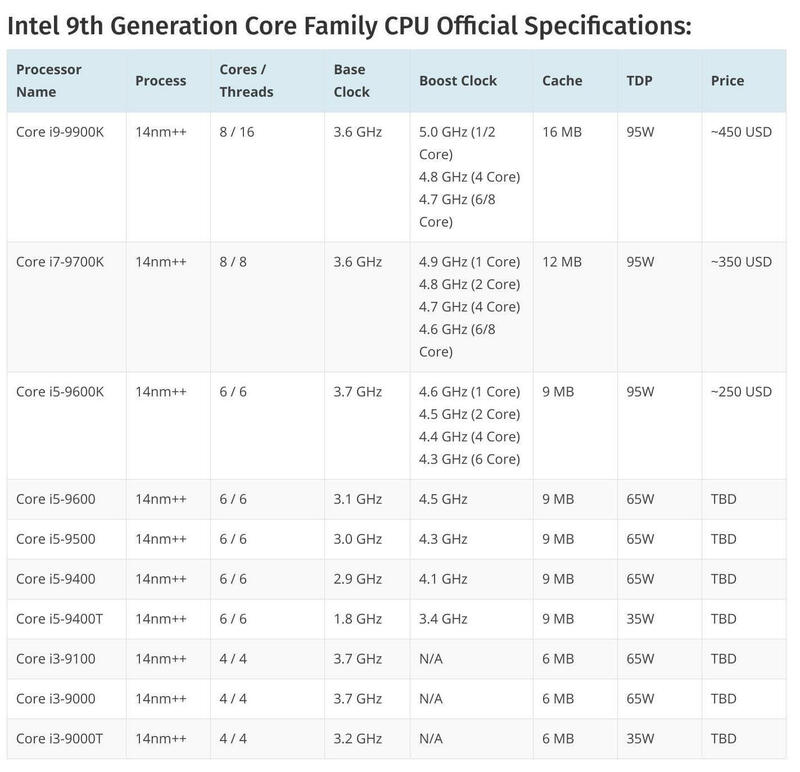 The table below, courtesy of WWCFTech, includes the other 9th-generation chips set for release next year. This is still all rumor, of course, but it’s looking increasingly likely that the new processors will be here in a few weeks’ time. Hopefully it won't be another paper launch. The 8 core Intel CPUs should drive the AMD 8 core CPUs prices down (as long as intel doesn't price them too high and they offer good perf/$). Intel has never driven prices down, and it's a coinflip's chance as to a paper launch. I still don't understand this policy of disabling hyper-threading for all but the highest end processor. It would make more sense to at least have a 6C/12T and 4C/8T in the lineup at the top of their respective ranges. I wonder how much difference there will be between the 8700k and 9700k, one has 8 cores but no hyper-threading while the other has 6 cores but hyper-threading. Bare in mind the 8700k would easily hit 4.7-4.8GHz on air cooling quite happily, very intrigued by this one. Edit: Did I read in my googles that they're using a new Chipset? Z390? So basically same series of chipset but you'll still need to buy a new motherboard anyway? Intel appears to be caught between its desire to fight Ryzen head on and not wanting to cannibalize their HEDT and Xeon lines. Z370 boards will work with the new CPUs. Z390 gives board partners the chance to make boards with stronger VRM circuits and better heat sinks, to handle the extra cores and high OCs. Not required, just desired. Just look at the performance differences between the 6700k/7700k which has 4 cores + Hyper Threading and 8600k 6 cores with no Hyperthreading in reviews then you'll get the idea. Good God so the i9 9900k will be $670 to $700 with tax in Canada. Interesting. And I’m looking for a new CPU aswell. Unfortunately I’m in the market for a laptop CPU. Battery life is the most important thing for me but also 4 fast cores to feed an external GPU so thunderbolt is preferred. Guessing the mobile 9 series isn’t going to be available anytime soon. Of course I fully expect the 9900K desktop part to be a cut above the current 8700K/2700X offerings. Intel will charge more for it too. Somehow I don’t think that will stop them selling them by the bucketload. Intel's hand forced by AMD. Same basic Intel architecture they've been using for nearly a decade rehashed again to add cores.